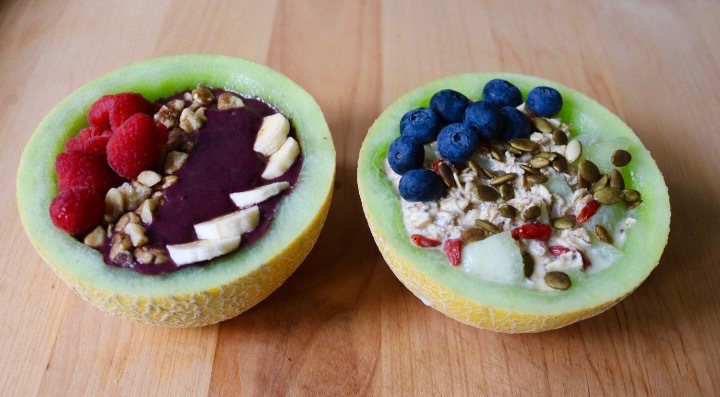 Melon smoothie breakfast bowls are perfect for a refreshing, nutrient-packed breakfast. Melons are now in season, so grab as many as you can. Vitamin C is an antioxidant vitamin that plays an important role in the growth and maintenance of all tissues in your body. It functions in wound healing and repair of cartilage, bones and teeth. Adults should receive 90 mg per day of vitamin C. A 1-cup serving of cantaloupe provides 65 mg of vitamin C. One cup of casaba melon provides 37 mg of vitamin C, and honeydew provides 30 mg.
Vitamin A is important for healthy teeth, skin, bone and mucous membranes. It helps the vision system by promoting retinal health. Insufficient vitamin A may lead to poor functioning of the immune system. Cantaloupe is high in vitamin A, with more than 25 percent of the recommended daily amount in a 1-cup serving. Toss the frozen acai, banana, and chopped up melon into a blender, and blend until smooth. Top with nuts and fruit. Enjoy your melon smoothie acai bowl! Mix oats, almond, milk and blueberries in a bowl. Cover and leave overnight. When ready to eat, remove oat mixture from fridge and mix in chopped melon. Spoon into melon shell, and top with seeds and fruit. Enjoy your museli melon breakfast bowl! For more Gorgeously Green recipes delivered to your inbox, subscribe to my weekly newsletter!